Alana Okun and Sam Snyder are participating in this summer’s 2018 Ulman Cancer Fund’s 4K for Cancer. Two Cherry Hill friends are preparing for the run of their lives as they help raise money for a nonprofit dedicated to supporting young adult cancer patients. Alana Okun, a junior at The College of New Jersey, and Sam Snyder, a junior at Rutgers University, are raising money ahead of a 49-day, 4,000-plus mile journey across the country this summer. The pair is participating in the annual Ulman Cancer Fund’s 4K for Cancer. As part of the program, each runner is required to raise a minimum of $4,500 for the Ulman Cancer Fund for Young Adults, a nonprofit organization focused around supporting young adults who are diagnosed with cancer. A junior at The College of New Jersey, Okun first heard about the 4K for Cancer run last year. Another Cherry Hill resident and a high school classmate of Okun’s, Mollie Taylor, took part in the 2017 run from San Francisco to Baltimore. Okun saw some of the photos Taylor was posting online and decided to look into the run. When Okun decided she would apply to participate, she reached out to her long-time friend, Snyder of Cherry Hill. 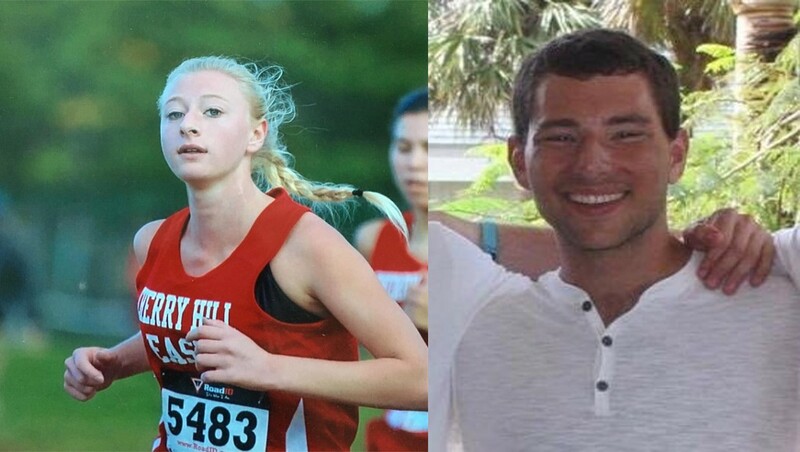 Snyder and Okun first became friends while attending Rosa International Middle School and both later attended Cherry Hill High School East, graduating in 2015. Snyder is now a junior at Rutgers University. Running has been a part of Okun’s life for a number of years. She ran cross country at Cherry Hill East and also ran one season in college at TCNJ. Though she no longer competes on the college team, Okun continues to run regularly on her own time. Snyder was also a high school athlete, competing on the soccer and tennis teams. However, he just recently picked up running as a hobby. One reason Okun decided to participate was the impact the Ulman Cancer Fund has on patients and their families. The fund provides various support services, including a training program to re-introduce cancer survivors to physical activity, free patient navigation services for patients and their family and scholarships for cancer survivors to continue their education. Cancer impacted Snyder’s family directly. Snyder’s grandmother is being treated for Hodgkin Lymphoma. In addition, his grandfather died at a young age from brain cancer when his mom was just 9 years old. Snyder talks about their stories on his fundraising page and how he is dedicating his run to his grandfather’s memory and his grandmother. “I will be dedicating my run to my grandfather’s memory and my grandmother’s current battle, amongst the numerous other friends and family members that have been affected my cancer who I will also be running for,” Snyder said. Okun and Snyder’s run will begin in San Francisco on June 17 and continue across the country to Boston, where it will end on Aug. 4. The route will travel through numerous landmarks and parks, including Grand Teton National Park, Yellowstone National Park and the Adirondack Mountains. Okun said she has done a lot of traveling around the country previously, but expects this run to be a different kind of sightseeing. Along the trip, the runners will stop at cancer centers to meet with patients and their families. These trips are one of the things Okun is looking forward to most. Okun and Snyder have to do regular training to prepare for the trip. Each of the runners receives a training plan when they sign up that shows them how much to run on a daily basis and builds them up for the long journey ahead. The most important thing for the runners to remember is the 4K for Cancer is much different than running a marathon. The pair is also working on raising the minimum $4,500 needed to participate in the event. They began fundraising in early December and both are already nearly halfway to their goal. Okun plans to amp up her fundraising efforts when she goes back to college for the spring semester. Snyder plans to design a special t-shirt as part of his fundraising where residents and businesses can be recognized for their contributions toward his run. “I will post a picture on my personal Facebook wall every day of the run for seven weeks to give an individual shout out to each sponsor,” Snyder said. The community can donate toward Okun and Snyder’s fundraising efforts at https://ulman.z2systems.com/alana-okun . Any money donated will go toward both Okun and Snyder. For more information on the Ulman Cancer Fund for Young Adults, visit www.ulmanfund.org.